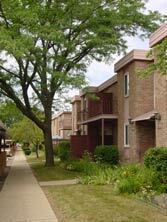 Affordable condo living directly on bus route with easy access to Ypsilanti, Eastern Michigan University & local freeways. Basements provide added bonus storage. Walk to local shops & restaurants. I will be delighted to provide you with up to date information on all listings in this or any other development. Please contact me by phone or e-mail. Just click below for details on recent sales or available units at the College Heights development.